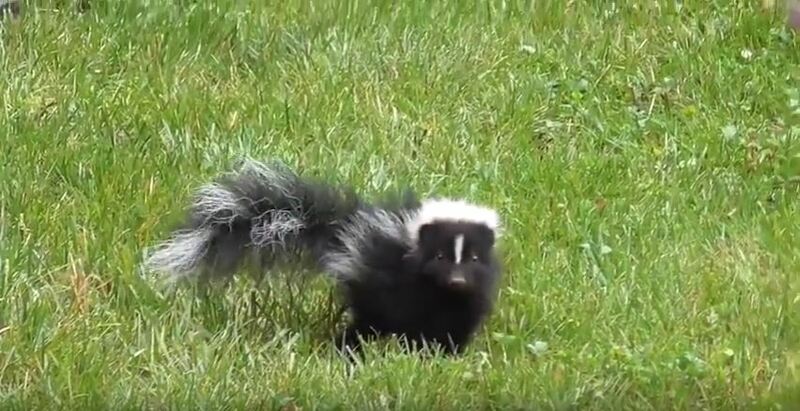 Many people are worried about getting sprayed by a skunk, but skunks spray rarely. When there is something approaching them that they consider scary, they do give a warning. They will stomp their front feet and they can fan out their tail. People may tend to heed such a warning and realize they should back off, but dogs often ignore the warning and charge toward the skunk. This is why dogs are sprayed much more often than people. Skunks are animals that have a good sense of smell, but they do not have good eyesight. When a dog is running at them, it will look to them like a scary and giant fast moving blob. This is why they spray to protect themselves, because it is the only defense they really have. If you find a skunk when you are walking about, you should stand still because the skunk will not see something if it does not move. You can also back off slowly since it is the sudden movement that comes close that will upset the animals. Talking soothingly and moving slowly can protect you. If you want to protect a dog from being sprayed, you should not let the dog free-roam during the night. Most sprays take place in the evening and at dusk. This is when the skunks will be going about their business and leaving their dens. Skunks are normally benign creatures and they want to continue with their business in a peaceful and ambling manner without being disrupted. Conflicts with skunks may be attributed to their clumsiness and their bad eyesight as they pass through the urban and suburban landscape. If you or your pet is sprayed, you should wash yourself or your pet with a mixture of baking soda and hydrogen peroxide with dish soap, and you can wash your dog with a washrag. You should rinse, then bathe and then rinse again. Sometimes the skunk may spray under the deck and the odor may reach the house. This takes place during the mating period when males get to the females who are not willing to mate. The male will be sprayed and will be sent to go on its way. If you do happen to get sprayed, there are many products that can neutralize the odor and they can be found at home and hardware stores.